Hello ... Hello ... my old friends ... It's great to see you once again! 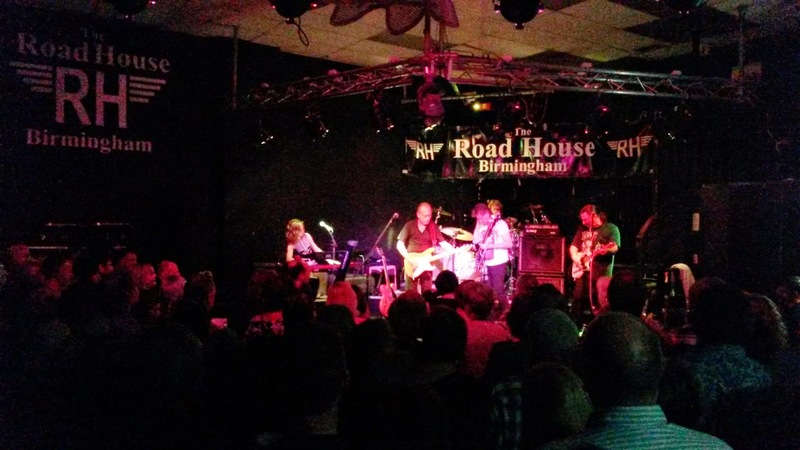 The Roadhouse, Birmingham was bursting at the seams last night as The Move landed for the latest leg of their 2014 UK tour last night [Friday 11th April]. The atmosphere was as electric as a light orchestra as the band revelled in this, their home town gig. As with the concert in Worcester last month, The Move were more than ably supported by the excellent Mods & Sods with their crowd rousing covers of classics by The Who, The Beatles, The Small Faces and The Kinks. This is a fine local band and they showed it with a superb pumped-up performance [oddly enough] of the Elvis Costello classic "Pump It Up" as a preface to the arrival of The Move. One of the benefits of going on tour is that a band gets time to gel and to refine and to learn not only songs, but each other. With such a rich song book of Roy Wood compositions and also the music of their contemporaries, The Move have a sure and proven formula for an explosive night of class music. This gig was truly memorable not least due to the fantastic atmosphere generated by the full house but also the inspired oratory of Trevor Burton between songs during the evening. He simply endeared himself to those in attendance by being ... himself ... and didn't we love it! Phil Tree and Trevor Burton shared vocal duties with Abby Brant and Tony Kelsey as the band served up most of their singles from "Night Of Fear" all the way through to "California Man" with Woody classic "Hello Suzie" and the iconic Jeff Lynne penned "Do Ya" in amongst a smattering of covers including [of course] the Marquee EP classic "Something Else", "Mercury Blues" and encore "Gimme Some Loving". I cannot fail to mention that, once again, Trev enchanted everyone present with his tribute to old pal Jimi Hendrix with his take on "Hey Joe". The assembled masses were sent home more than happy after singing in unison with the anthemic "Blackberry Way" in a rousing finale. This gig also saw 'Movette' Abby Brant again impress with her keyboard contribution and Tony Kelsey again showed what a valuable addition he is to this the 2014 incarnation of a truly iconic band. Last - but not least - it was a real pleasure to see the percussion prowess of Bev Bevan in action again, especially during "Mercury Blues" and "Wild Thing", proving what a world class drummer he still is. All in all, it was a highly anticipated gig that well and truly delivered on the night. At the end of the evening, Trevor announced that, sadly, this the current Move tour would be their last. There are two  things to take away from his statement. Firstly, ELOBF hopes that the band will continue to perform live from time to time after the current tour finishes. Secondly, wouldn't it be fitting if their final Midlands date of the tour at The Robin 2 on Thursday 5th June is another sell-out? Yours Truly KJS and ELO Beatles Forever [ELOBF] sincerely hope so! ELO Beatles Forever [ELOBF] recommends The Move featuring Bev Bevan & Trevor Burton to those enlightened folks who also like ELO, Jeff Lynne, Roy Wood, 'Brum Beat', The Idle Race, The Beatles and related artistes.